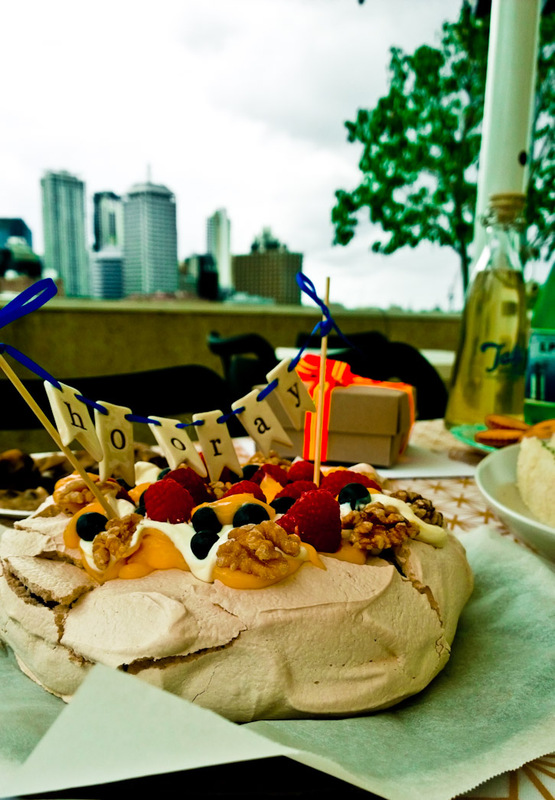 There’s nothing quite like a Pavlova to elicit a wistful and starry-eyed response from those about to eat it. It makes an appearance at all kinds of summer celebrations and is often the queen of the table when deserts appear. To be honest, I love them because of their simplicity. They’re a breeze to make and they showcase stunning summer ingredients like nothing else – and then there are the starry-eyed recipients. Named for a Russian ballerina but not well known outside of the antipodes I was glad to introduce the Finn’s family to it one lunchtime to much acclaim. A new experience for them and a success all around. 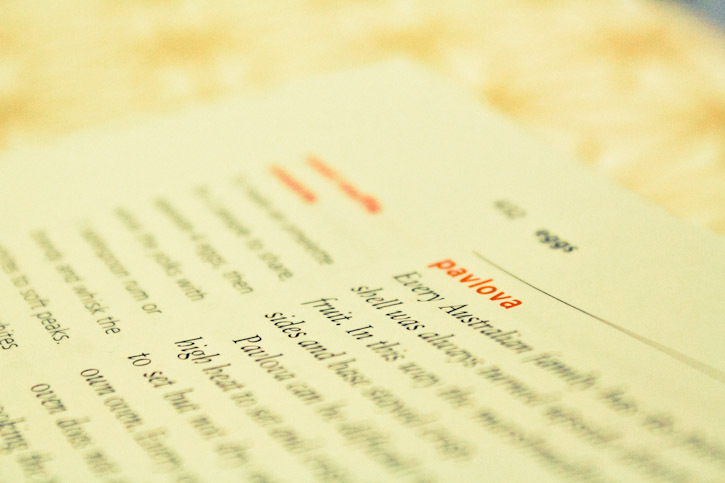 This Pav recipe comes from my heavily dog-eared copy of Stephanie Alexander’s The Cooks Companion and has become a staple for me. When you’ve found the best, there’s no need to mess, (well, except that I can’t help it and use raw or golden caster sugar instead of white to transform the meringue to an almost rose gold caramel – but that’s it I swear). 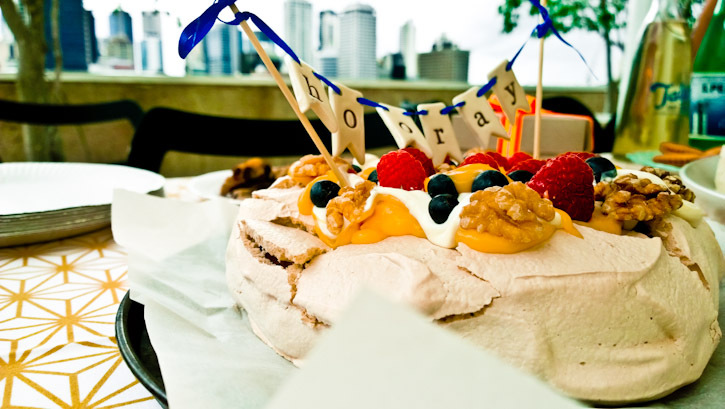 A lovely friend and colleague left the team this week past to start a new exciting adventure as a soon to be parent, so what better way to celebrate a new generation of Pavlova lovers than with this. Set your oven to 180c. Beat the egg whites with the salt until firm. Add the sugar a little at a time and beat until shiny and stiff (and no longer gritty). Add the vanilla, vinegar and cornflour and gently fold into the mixture until combined. Transfer on to a prepared baking tray lined with greaseproof paper. Flatten the mound a little and smooth out the sides. As I don’t invert my pavs after baking this is the point you can get creative. 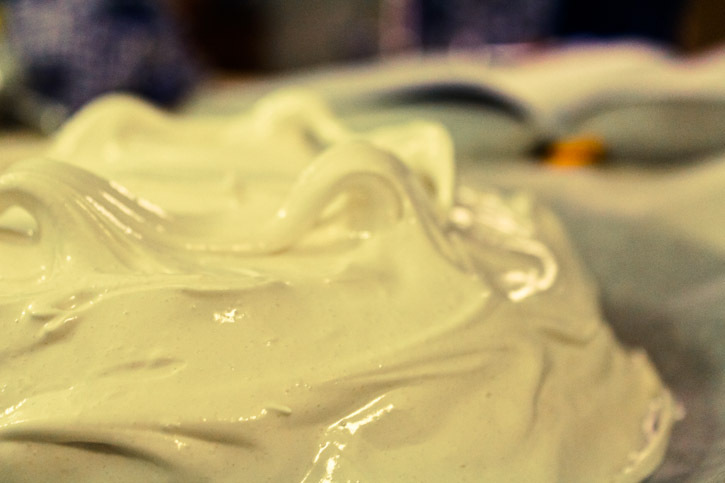 Using a spatula pat the meringue around the edges of the top lifting gentle waves and loops across the surface. Don’t worry too much about the centre as it will be covered with cream. Place into the oven and reduce the temperature to 150c and bake for 30 minutes. Then reduce again to 120c and bake for an additional 45 minutes. 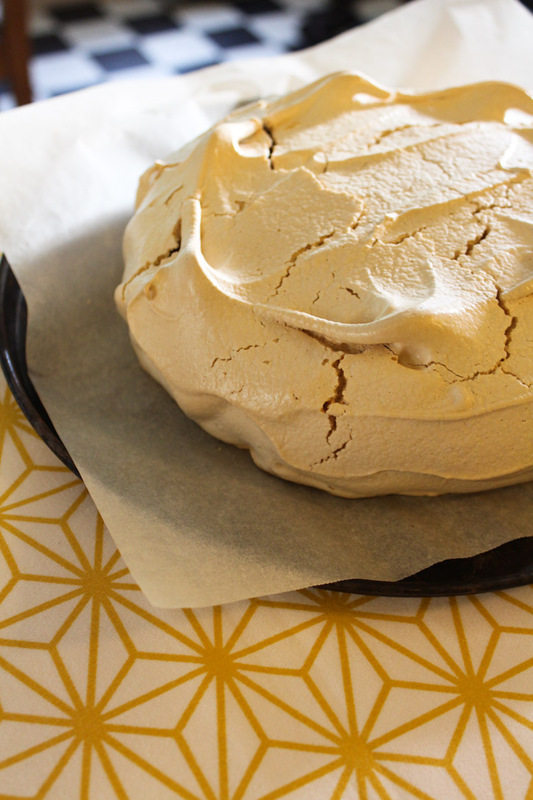 Switch off the oven and allow the meringue to cool completely. I often bake it the night before the party and leave it in the oven overnight. Because I make this curd often to dress a pavlova, it can sometimes be runnier than you’re probably used too, but don’t worry – that’s how you want it. If you want the curd for crumpets in the morning, pop it into the fridge to set a little or reduce the lemon juice to around 100ml if you’re using larger lemons. 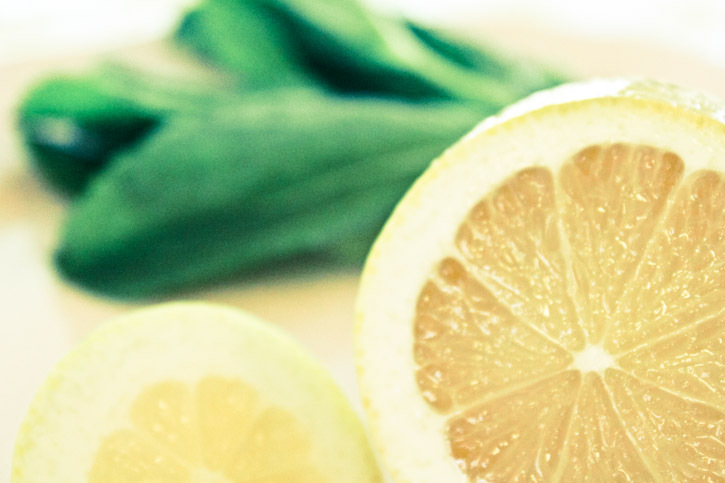 Combine the sugar, egg yolks, butter and the juice and rind of the lemons in a small saucepan. Stir over a gentle heat until the butter is melted and the mixture is combined. Bring to a simmer while stirring and cook for a few minutes until think and the mixture coats the back of a wooden spoon. And there you have it – instant lemon curd and possibly the best unexpected pavlova topping you’re likely to come across. Dress your cooled meringue with thick dollopy cream (or light fluffy whipped if you prefer), spoonfuls of the home-made lemon curd, raspberries, blueberries and walnuts. For a long time I thought nothing could beat the classic Finnish Pulla. The somewhere between light and dense, cardamom laced, delicately sweet ubiquitous bread that is a staple in Finnish households, and eaten daily by me when in Finland. Once I’d lived in Scandinavia, however, I discovered a smorgasbord of delightful variations, some appearing only once a year. And as you know I’m somewhat obsessed with holiday food – I was sold. 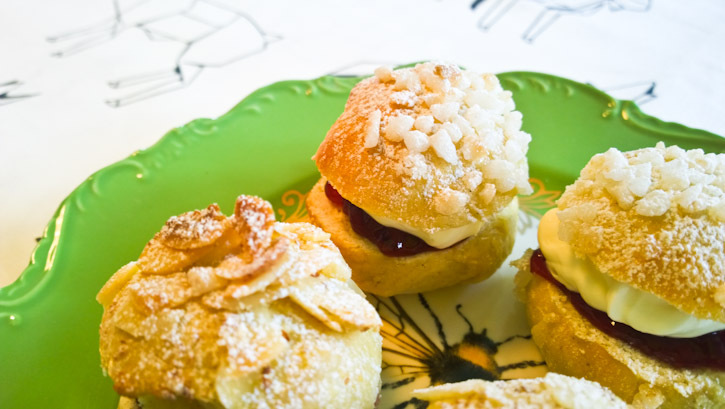 Enter the Laskiaispulla – the pulla for Shrove Tuesday. Push those common pancakes aside – Lent has a new King. 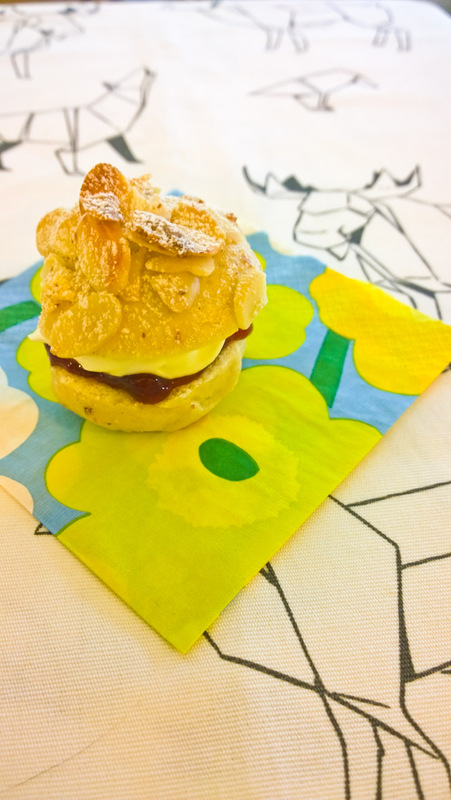 Also known as Semla in Swedish, vastlakukkel in Estonian or fastelavnsbolle in Danish and Norwegian this little bun loved across the still icy Spring shores of the Baltic. What better way to toast the season of going without than by stuffing your face with a jam and cream filled taste explosion. The recipe below is for half the usual batch – even I can’t devour 32 buns, but if you’ve got a big group of hungry pilgrims popping around to feast one last time before Easter by all means double it. 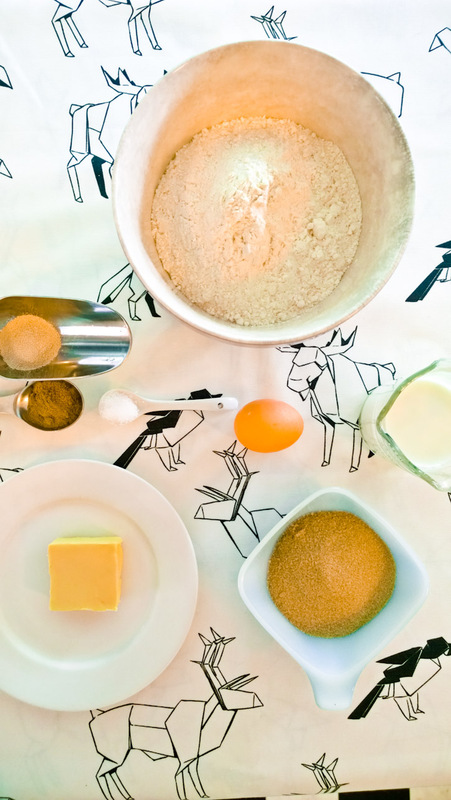 Combine the yeast, sugar, salt, cardamom, milk, butter and beaten egg in your mixing bowl. Using the standard mixing blade switch on and gradually add 1 cup of flour until the mixture in smooth. Switch to the dough hook and incorporate the rest of the flour. Kneed in your mixer for 5 minutes or turn out onto a floured surface and knead by had for 10 minutes until the dough is smooth and elastic. Cover and allow to rise for up to two hours or until at least doubled in size. Once risen turn out and divide into 16 equal portions. Gently roll each portion into a ball and place on a lined baking tray to rise again. 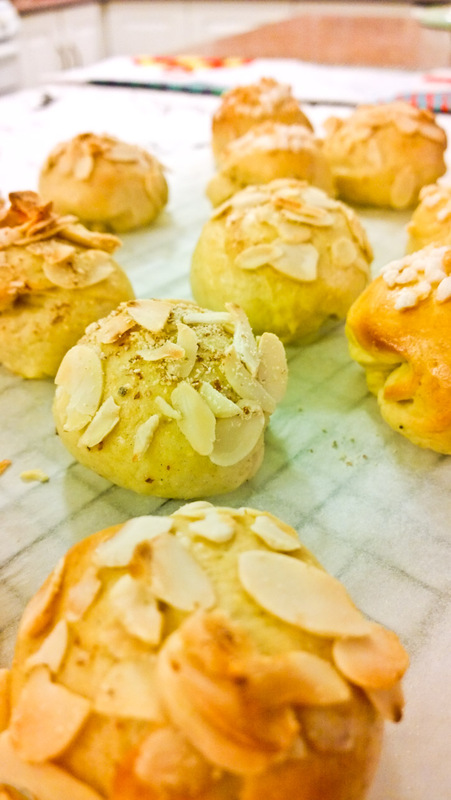 Gently brush the risen dough with an egg wash and sprinkle the almonds or pearl sugar onto the rolls. Bake at 190c for12-15 minutes until lightly golden. Ding – rolls become buns. Allow the buns to cool before adorning with the jam and cream. Slice the top of each bun and spread a layer of jam on the bottom half, top with cream and pop the top back on. 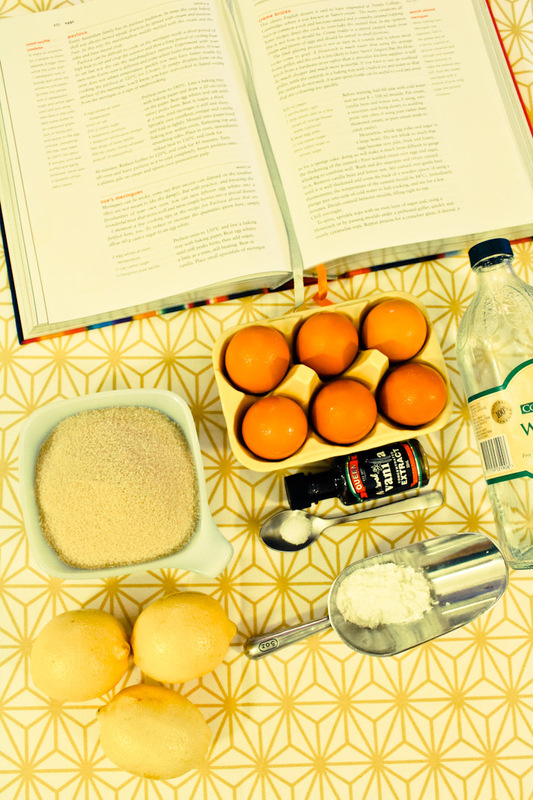 Dust with icing sugar and you’ve a got a perfect last supper on your hands. 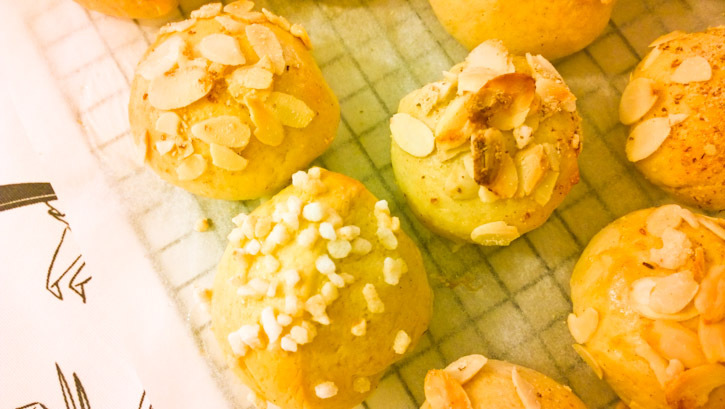 A delicious alternative is to fill the buns with almond paste – this can be made by processing blanched almonds, a couple of tablespoons of icing sugar and a dash of cream until it comes together to form a paste. It’s worth a try. 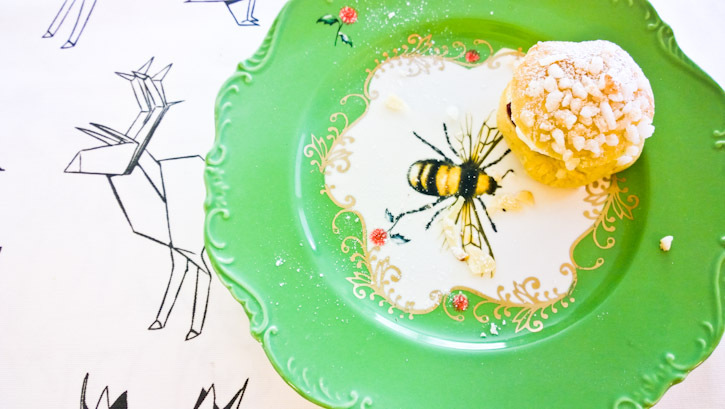 These buns are hard to put down; cute, perfectly proportioned and undeniably moreish – I’ve eaten three just writing this post. A solemn and hungry Lent to all. © The Scandinavian Baker 2019. All Rights Reserved.